RIM’s stock has made quite a run yesterday, going up some 12% after months of nearly constant decline and it all seems based on a rumor about Vodafone acquiring the Canadian phone maker. 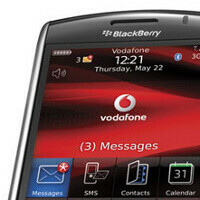 The Wall Street Journal reported that the UK telco was a possible buyer for RIM. The stock gain was the biggest for the ‘Berry maker in more than the two and a half years since 2009. The Canadian company has lost 60% of its market value since the start of the year. Some analysts however downplayed the rumor saying that an acquisition wasn’t much likely, mostly because Vodafone is a carrier, so it has a radically different business profile and tying closely with a phone maker would mean that others would feel at a disadvantage. RIM has bet its future on the QNX operating system, expected to roll out next year on ‘Berries, but we’re yet to see whether it won’t be too late for another mobile platform to join the race. 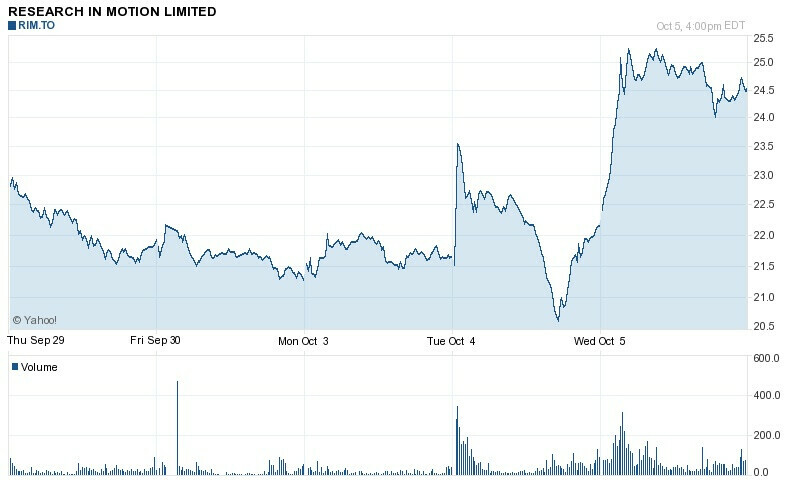 RIM stock in the last couple of days. Analysts also agree that a potential buyer is most likely to come from North America, where the Canadians have established strong positions. Moreover, BlackBerries are in all levels of corporate and governmental structures, which means that the US officials won’t be looking favorably if a foreign company acquires the phone maker. Previously, Microsoft and Oracle have been suggested as possibly buyers, but those rumors remain unsubstantiated. Vodafone declined to comment on the rumor. Well, if Vodafone acquired RIM, they could at least get rid of the co-Bozos as a condition of the acquisition. Another rumor I ain't buying until I see it, along with the one about Samsung not making anymore Windows Phones (not true) and Sprint getting the iPhone 5 all by itself (would have had to been an iPhone 5 first, so again not true). RIM is still selling a bunch of devices and making quite a bit of money. A company like them needs to fall farther than they have and been out of resources first. See Palm for an example. If BBX (new name for QNX) flops, than they may be in deep, dark doggy-doo-doo. They will be fine until those devices launch. @snow - RIM needs to get BBX devices to market ASAP and the devices must be a success. A repeat of the PlayBook experience is a fail. RIM does not have the luxury of time. Apple actually did RIM a favor with the 4S. If Apple had released an iPhone 5 equipped like many of the rumors were predicting, RIM would have been in a world of hurt since most of the iPhone sales gains have recently been from BB owners converting to iOS. Totally agree. I believe their resources are strained, their investors are sharpening their pitchforks and getting the torches (pun intended) ready, and that even the most loyal fans of Blackberry are beginning to understand this company is jogging in place.